A great nightspot in Palma de Mallorca. 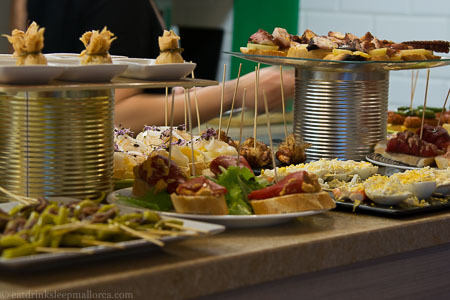 This new gastronomic centre in Palma welcomed its first paying customers on June 20th this year. I wrote a post about it that same day, having been at the opening party the previous evening. 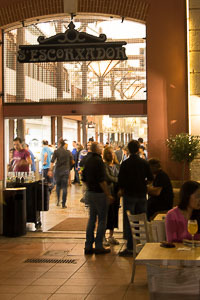 It seems that Mallorca’s capital really was ready for this new and unique (for Mallorca) concept in eating out: by the beginning of September, more than 20,000 people had visited Mercado Gastronómico San Juan at S’Escorxador complex. I couldn’t wait to return, but this time with The Boss (who wasn’t at the party). Time hasn’t been on our side, as I’ve been visiting lots of restaurants lately in connection with my writing work. 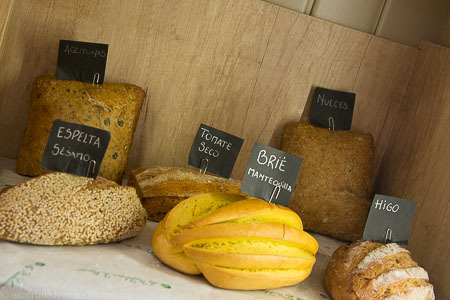 But this month – four months after Mercado Gastronómico San Juan opened – we’ve managed two visits. 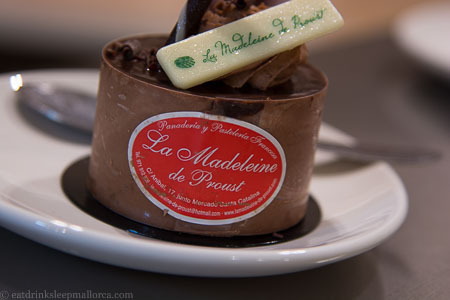 Our first was after an appointment in Palma, and we arrived at 7pm. The place was buzzing and most of the customers seemed to be locals. It’s a really sociable place to meet friends – or even make new ones. 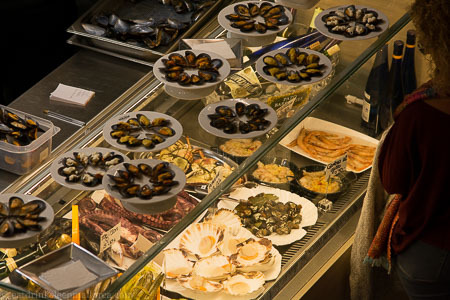 As we sat eating pintxos and having a glass of wine at one of the long central tables, we fell easily into a conversation about food with a Mallorcan couple at the same table. Pinxtos galore . . .
Pizza? Don’t mind if I do . . . Shell out for some of these . . .
We returned this week, to cheer ourselves up after a visit to the dentist’s. We expected to find the place rather quiet late afternoon, but there were plenty of other people there enjoying the ambience and choice of food and drink. 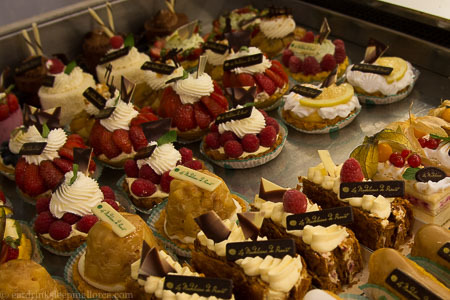 After a few savouries and a small beer, we made a return visit to the patisserie La Madeleine de Proust for a cake. A difficult choice . . .
Decision made . . .
Buy a loaf while you’re there . 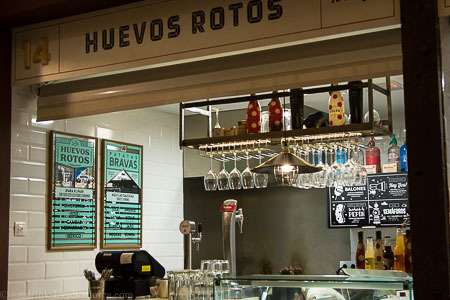 . .
Great things are happening at Mercado Gastronómico San Juan – including showcooking events and gastronomic dinners in the purpose-designed space on the first floor. Other events include live music on certain nights and special themed events and product promotions. You can find out the latest news and events happening here by ‘liking’ their Facebook page to keep up to date with activities and news. 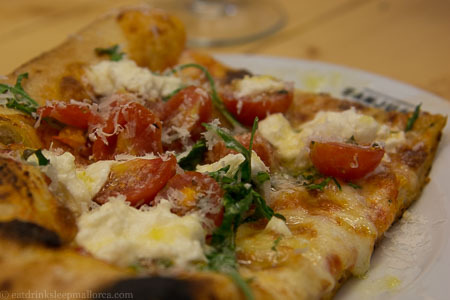 Mercado Gastronómico San Juan may not be in the heart of Palma, but it’s worth making your way to S’Escorxador to experience this fun way of eating, drinking, and socialising. I have only one complaint. It’s a long way from our home! We’ve used the underground public car park at S’Escorxador on both occasions; it couldn’t be more conveniently located.